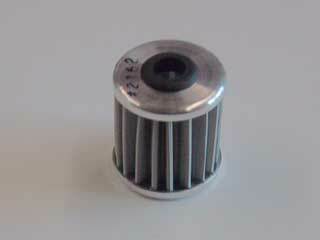 Stainless Steel Oil filter for listed Suzuki motorcycles. The K&P Engineering filter element is made from medical grade, type 304 stainless steel micronic filter cloth to provide unmatched protection against oil contamination and resultant engine damage. A one inch square of this material flows an incredible 1.9 gallons of oil per minute at only 1 PSI pump pressure. The adhesive used in the filter assembly process is good to 600 degrees Fahrenheit, far above normal engine operating temperatures. A super strength nickel-plated neodymium rare earth magnet is installed in the top of the element for magnetic pre-filtering of the oil. The sophisticated bypass is engineered for proper differential pressures and consistent operation, delivering a greater percentage of filtered oil while being very easy to clean.